The AID* Kit is an expanded tool kit for the auxin-inducible degron (AID) system in budding yeast. By expanding the AID degron sequence to include tags for easy detection by antibodies/microscopy, and introducing a set of selection markers, this tool kit provides enhanced flexibility in applying the AID system by facilitating the detection of AID-tagged proteins, comparing their stability with those of untagged or endogenous proteins, and exerting a better control over initial protein levels. This kit will be shipped as bacterial glycerol stocks in a 96-well plate format. 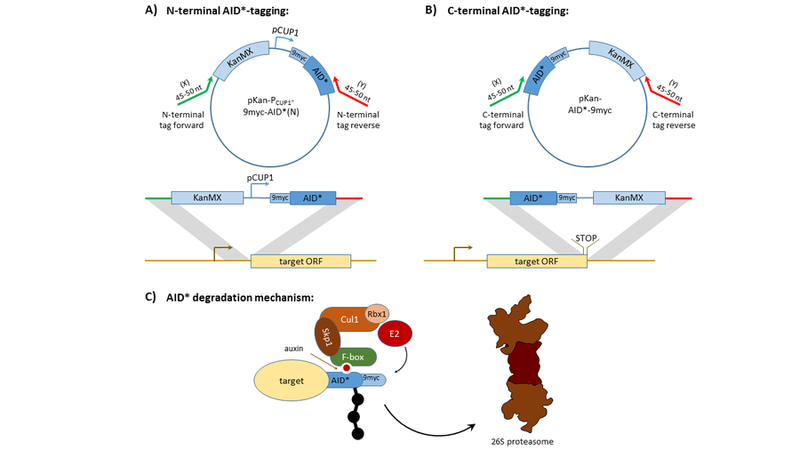 An expanded tool kit for the auxin-inducible degron system in budding yeast. M. Morawska & H.D. Ulrich Yeast. 2013 Sep 1;30(9):341-51. doi: 10.1002/yea.2967. PubMed PMID: 23836714. Fusion of inducible degradation signals, so-called degrons, to cellular proteins is an elegant method of controlling protein levels in vivo. In the budding yeast, Saccharomyces cerevisiae, this is most conveniently accomplished by a PCR-based tagging strategy where a degron tag is fused to the endogenous gene of interest. The AID* tool kit for degron tagging in S. cerevisiae contains a set of vectors to be used as PCR templates for fusion of the “AID*” tag, expanded by a range of epitopes for ease of detection by commercial antibodies or fluorescence microscopy. The vectors are compatible with PCR-based genomic tagging strategies, allow for C- or N-terminal fusion of the degron, and provide a range of selection markers (kanMX, hphNT, natNT, HIS3MX). In addition, the kit includes vectors for expression of an F-box protein compatible with the yeast SCF ubiquitin ligase, which is required to induce degradation of the tagged protein upon addition of auxin. Induction of degradation is reversible and quick, measured in minutes rather than hours. Use of the AID* tool kit. A) Tagging strategy for N-terminal AID* fusions, involving replacement of the endogenous promoter. Plasmid pKan-PCUP1-9myc-AID*(N) is shown as a representative PCR template. B) Tagging strategy for C-terminal AID* fusions, involving replacement of the STOP codon of the target gene. Plasmid pKan-AID*-9myc is shown as a representative PCR template. C) Principle of AID*-mediated protein degradation, involving auxin-mediated recognition of the AID* tag by an F-box protein as part of a Cul1-based SFC-type ubiquitin ligase and subsequent targeting to the 26S proteasome. Up-to-date information regarding this kit can be found at the Ulrich Lab website. Plasmids pRS303-PADH1-AFB2 and YIp204-PADH1-AFB2 from the Ulrich Lab may also be required for some experiments. These plasmids are not included in the kit and have to be ordered separately.